Have you ever found yourself looking back at your notes and to see doodles you made to help you remember information, draw relationships between ideas, or to create a task list? Us, too. 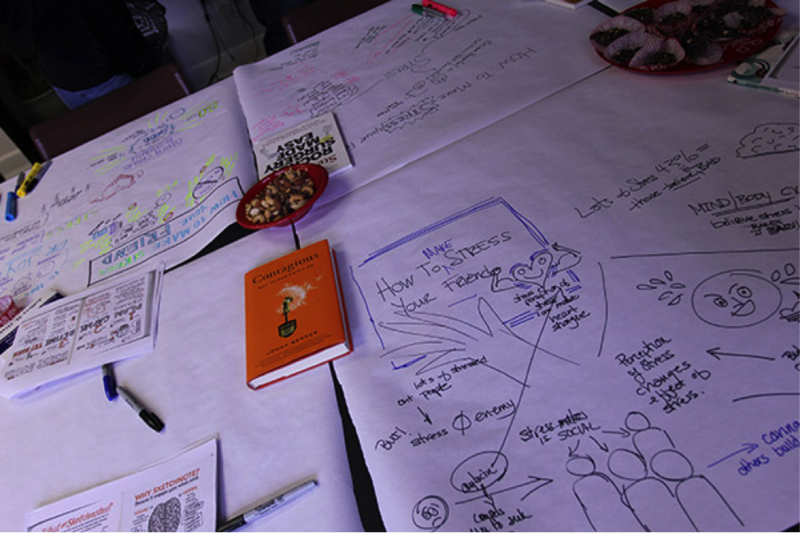 They may look like doodles but they help us capture the big ideas. That’s why we wanted to explore sketchnoting as another way to take notes. Sketchnoting is a process of turning ideas into visual notes. Rather than writing down words in a bulleted or paragraph form, it combines words and images to represent ideas, thoughts, and concepts. We introduced the entire Red Privet team to sketchnoting by watching a TED talk together. Each team member had a piece of butcher paper, different colored sharpies, and space to stand or sit. Practicing with a diverse group allowed us to see the different interpretations of ideas. We saw how people quickly adapted the same information. For example, when the presenter mentioned how the brain releases Oxytocin, each of us put that information into different visualizations with words, shapes and emphasis. By practicing together, we not only practiced a method to synthesize information quickly but also built confidence in our sketching skills. By representing ideas and text as images, we noticed a real-time synthesis happening during the session. Rather than quickly writing down detailed notes, sketchnoting forced us to think at a higher level. What is the premise of the presenter’s session? What are the main takeaways? Anyone! If you can draw basic shapes, you can sketchnote. Everyone at Red Privet from designers, researchers, and business development to project managers practiced together. 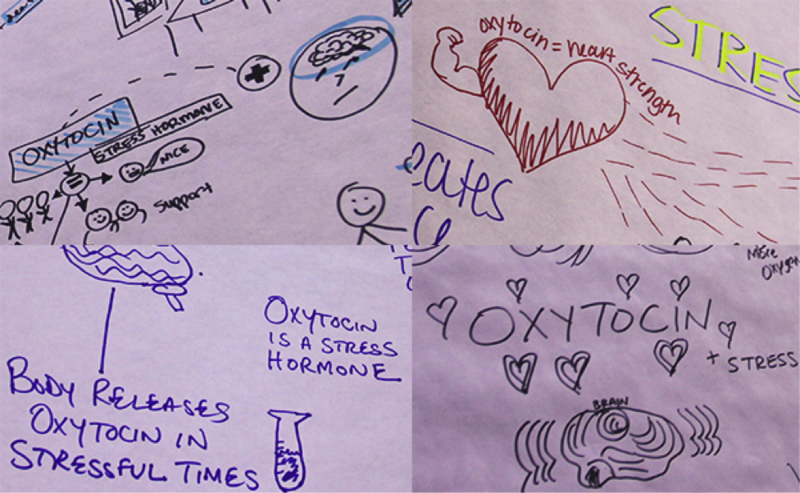 Sketchnoting is great for conferences, non-client meetings, and workshops. It also is a great tool for team building exercises and planned workshops with clients. While not suited for capturing detailed information, sketchnotes can be used as second step to synthesize insights. Use a Podcast or TED talk, critique meetings, or ideation sessions. We used a TED talk for our practice session; it provided just enough material in a short amount of time. Find the tools you’re most comfortable with, either digital, like a tablet, or physical, like a sketchbook and pen. Aside from having the right tools, it’s also about the right mindset. While you may feel tempted to make every note a visual image, remember to ask yourself what the big picture is. Don’t assume that those with an art or visual background will pick up sketchnoting faster. During our session, we saw those new to sketchnoting defaulted to bulleted notes or tried to translate each sentence visually. Quickly, they focused on the drawing and forgot to listen, not just hear, the presentation. It’s not just a practice of translation, but rather of synthesis. Above all else: Practice. Practice. Practice. Sketchnoting connects us to our inner Albert Einstein. We’re used to taking notes already translated into verbal and mathematical terms. Take a step back and begin with the visual images.